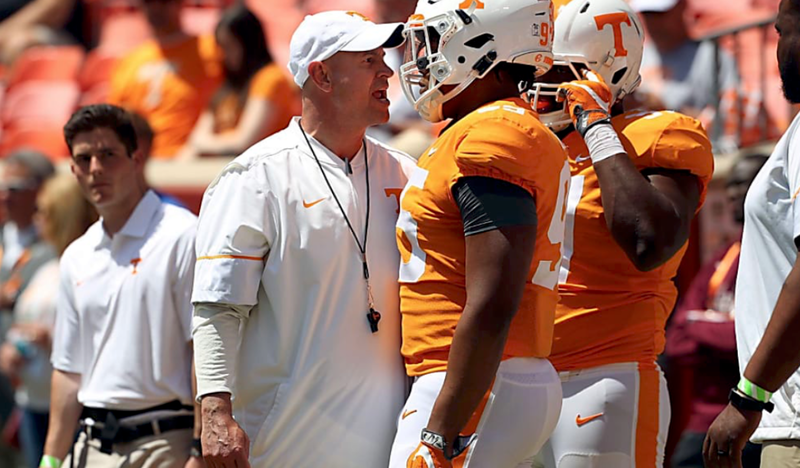 Last year in Tennessee, coach Jeremy Pruitt’s first partial class in Knoxville took a lot of home run cuts in the late recruiting period but didn’t have many hits. They signed quality defensive backs Bryce Thompson and Trevon Flowers but missed on most of their big targets. That isn’t the case in 2019. The Vols were massive winners this past Wednesday, closing their recruiting class with the top uncommitted offensive player and defensive player entering the day. Massive 5-star offensive tackle Darnell Wright, who was long thought to be a UT lean, signed with the Vols after late overtures from in-state school West Virginia. Tennessee also rallied late to steal 4-star linebacker Henry To’oto’o from Alabama and Washington, grabbing the nation’s number 10 and 44 players. Speedy 3-star cornerback Kenney Solomon also chose Tennessee over Louisville and Colorado on Wednesday. Wright and To’oto’o made major national headlines and proved the former Alabama defensive coordinator is a recruiting force moving forward. Those two paired with guys like Quavaris Crouch, Wanya Morris, Ramel Keyton and Jaylen McCollough, who highlight a number 12-ranked class that could go a long way in helping the 5-7 Vols become a force in the SEC East. Tennessee’s ace recruiter this cycle was Brian Niedermeyer, who was the lead recruiter for Crouch, Wright, To’oto’o, Tyus Fields, Savion Williams and more. He was named the national recruiter of the year for his efforts by 247Sports.com. Rocky Top is feeling like home sweet home to a lot of top-shelf prospects again, and I’m sure Tennessee fans everywhere are rejoicing. 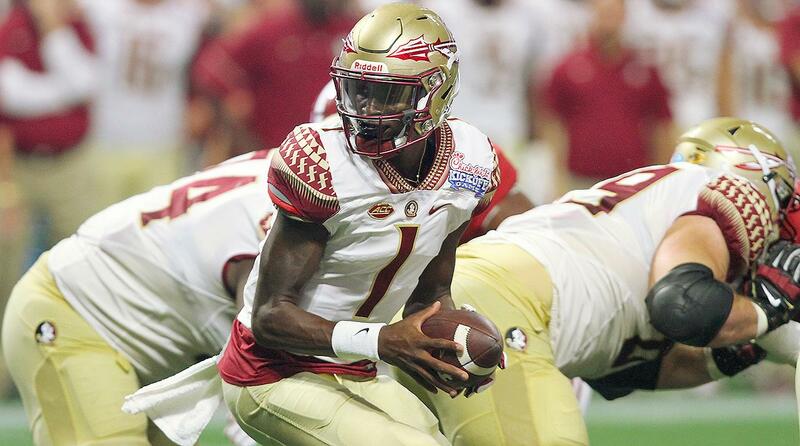 Florida State’s quarterback situation is bleak and dire, and that’s not joke. After Deondre Francois was removed from the program, the Seminoles failed to follow through and sign 4-star prospect Lance LeGendre on Wednesday. It was a stunning turn of events that saw the supposed Seminole sign with Maryland and coach Mike Locksley instead. The ‘Noles lost prized commit Sam Howell in the early signing period to home-state North Carolina, leaving coach Willie Taggart with a tenuous quarterback situation. All that’s transpired since then makes things much, much worse. At this point, FSU may need to hold open tryouts on campus to back up James Blackman. It is NOT a good sign if you have to hold open tryouts for a backup. There’s still a possibility that talented Louisville transfer Jordan Travis could be granted a hardship waiver from the NCAA, and there’s also walk-on Nolan McDonald, who was a 3-star prospect in the 2017 class who committed to Air Force but never followed through. LeGendre’s Wednesday decision is just the latest in a long line of puzzling or unfortunate occurrences that transpired under Taggart. At this point, it’s essential the Seminoles hit the transfer market hard to find somebody for depth purposes, if nothing else. Getting the 4-star New Orleans signal-caller was huge for Locksley at Maryland, but it’s another blow to the early FSU tenure of Taggart, who failed to take the ‘Noles to a bowl game in 2018. Quarterback recruiting continues to be an epic fail for the ‘Noles. Every year, the Ohio State Buckeyes sit near the top of the recruiting rankings, but this year that wasn’t the case. 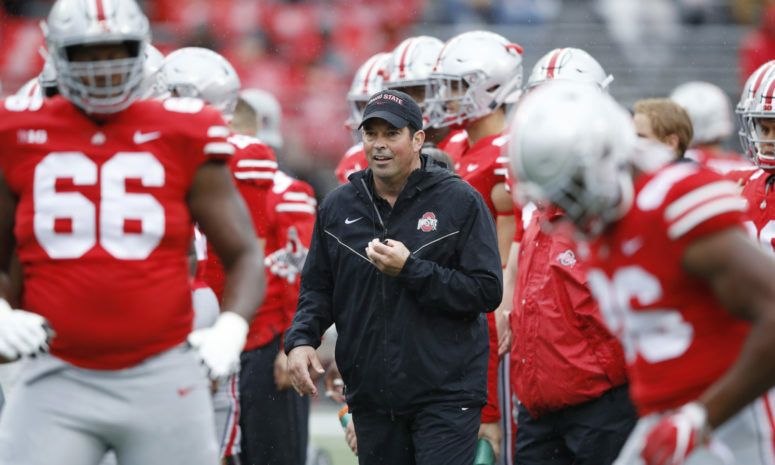 A group of 17 commitments is rarely going to break the top 10, and coach Ryan Day’s first group in Columbus didn’t. Day’s Buckeyes ended up finishing 14th overall. But if you think this was a bad class, look closer. Among those signees are three 5-star prospects and nine 4-stars. Still, things didn’t go the way Day hoped last Wednesday. Though he got a huge pickup in offensive lineman Enokk Vimahi, longtime offensive line commitment Doug Nester flipped to Virginia Tech. This is hardly a blip for the Buckeyes, but does it open the window just a tiny crack for other Big Ten programs to close the gap? Michigan and Penn State’s recruiting classes are clearly better, stronger and deeper than the Buckeyes’ this year. The Wolverines’ class especially looks terrific, highlighted by safety Daxton Hill, elite running back Zach Charbonnet and 5-star defensive tackle Chris Hinton. Though Penn State’s class is rated 13th, the Nittany Lions have a class of 23 players. Other teams like Wisconsin, Nebraska, Purdue and Michigan State had relatively good classes again. Maryland’s ranking isn’t good, but the Terrapins enjoyed a late surge and are going to be a force on the trail looking ahead with Mike Locksley at the helm. Nobody is suggesting Ohio State is ready to relinquish its Big Ten crown. Day is an up-and-coming coach who has hired a good staff and has a roster full of playmakers coming back. You can’t count transfer quarterback Justin Fields in this class, but he has a chance to keep the Buckeyes elite. Yet if you’re Michigan, Penn State and others, you have to look for hope. And they may have closed the gap just a tad during this cycle. Sorry, Big 12 defense’s, your long-standing national nightmare is nowhere near over. 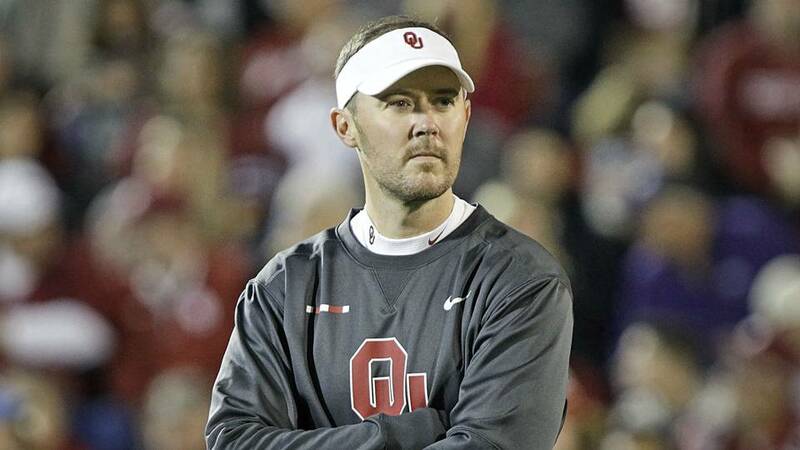 If you thought maybe coach Lincoln Riley’s high-flying Boomer Sooner Show would hit the skids a little with Kyler Murray and Marquise Brown off to the NFL, think again. The Sooners went out and grabbed Alabama transfer quarterback Jalen Hurts. Now, they’re bringing in arguably the best stable of offensive recruits in the country. Elite signal-caller Spencer Rattler will be a star in Norman if he sticks around, waits his turn and gets a chance to shine behind center. It’s going to be hard for him to fail with three dynamic receivers in the same class along with him. The Sooners added a little embarrassment to their riches when 5-star Jadon Haselwood committed to them in the Army All-American Bowl, joining Theo Wease and Trejan Bridges. Oklahoma always has a big pass-catching tight end to complement its offense, and Austin Stogner looks like the future at that position. In case you forgot about returnees such as big-play receiver CeeDee Lamb and 1,000-yard rushing freshman Kennedy Brooks (as well as backfield partner Trey Sermon) it isn’t like OU is having to restock an empty pantry, either. There are holes to be mended defensively, of course, but the Sooners aren’t dropping from the top of the Big 12 standings. Not with the kind of offensive talent they’re stockpiling in Norman.